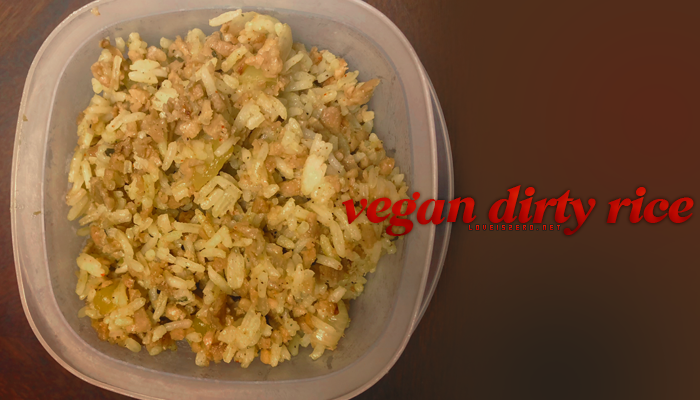 How to make this vegan version of dirty rice, taste better than the meat verison. black pepper, cajun seasoning, garlic powder, onion powder, seasoning salt, garlic salt, polity seasoning, oregano, thyme, parsley, sage, turmeric, teriyaki sauce, liquid aminos, tamari, apple cider vinegar, liquid smoke, and one cube of not chick’n. I use jasmine rice, and I cook it in the microwave 5 minutes high, 10 minutes medium, and let it sit for a few minutes. 1 cup of rice, and 2 cups of water. Then when your done add some olive oil, some turmeric, and some cajun seasoning. Mix with a spoon. While your rice is cooking take your 1 ½ cups of TVP and put it in a bowl with the same amount of hot water and let it set 5-10 minutes. While your TVP is in the hot water in a non-stick pan with olive oil saute your onion, then add your bell pepper, and then your garlic. When that is to your liking add in the TVP and the rest of the seasoning and spices. When that is cooked to your liking add to rice and mix.